This big bulbous root is also known as Mexican Turnip, Mexican Potato, and Mexican Yam. If you plan to till a place and add these tubers into your garden, there are a few things to bear in mind. The exterior is yellow and papery and the flesh inside is creamy white. The taste is starchy, a bit sweet and often eaten raw in salads. 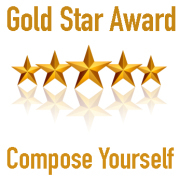 When cooked it’s added to soups and stir fries. It’s a great substitute for water chestnuts as its textures are quite similar. I decided to make two dishes with my (1) jicama. 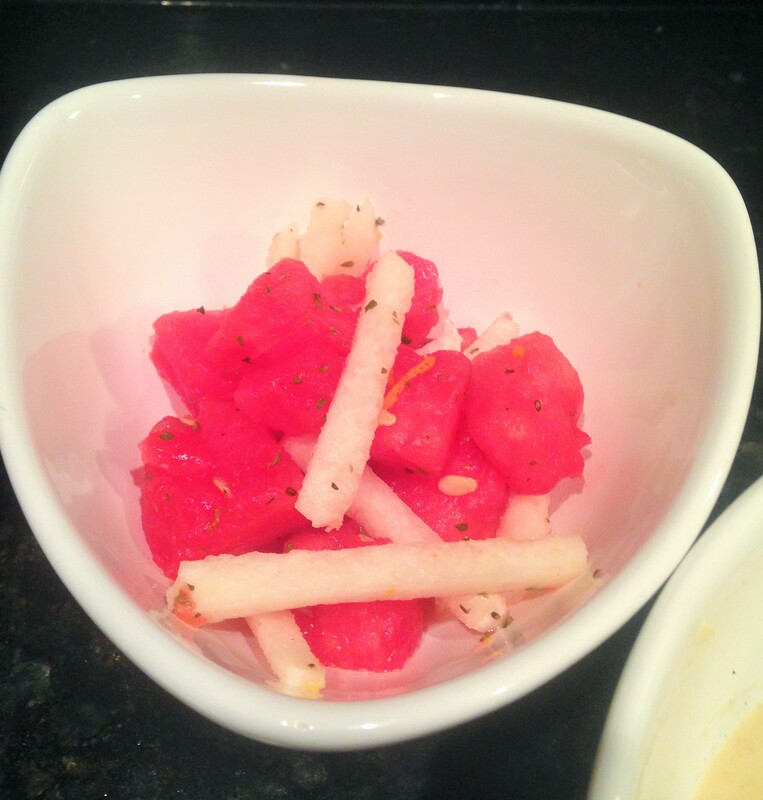 First I prepared a light/crisp watermelon and jicama salad which turned out very refreshing. 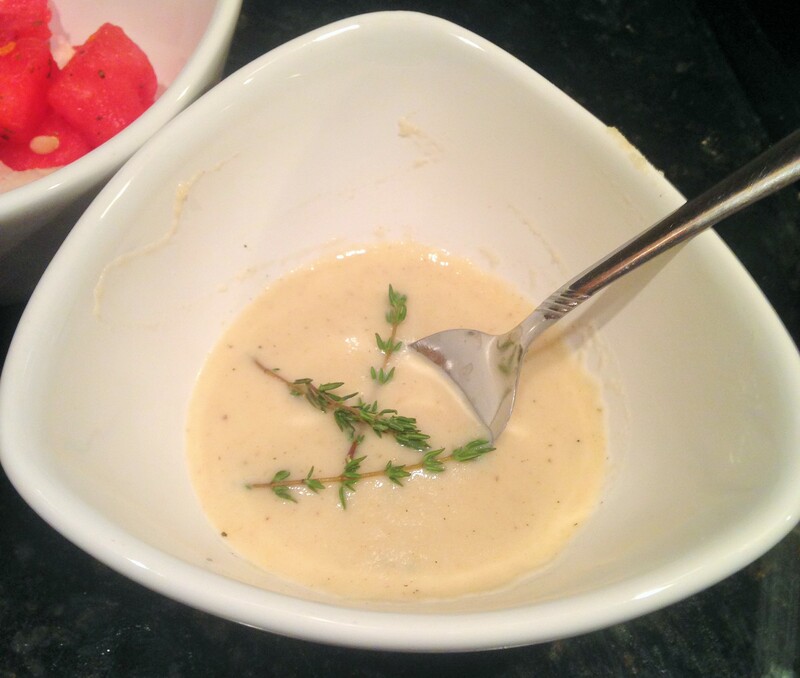 Next I created a savory cream of jicama soup that was reminiscent of potato soup, albeit a little sweeter. Below are the steps I took in creating this weeks mystery dishes. Hope you enjoy! Above are the ingredients used for my Watermelon and Jicama salad. (less the fresh mint… I forgot to photograph) Of course there is the jicama and watermelon, along with orange juice, orange zest, lime juice, lime zest, honey and fresh mint. Basically, everything is chopped and tossed. First I cut the watermelon into bite sized pieces. 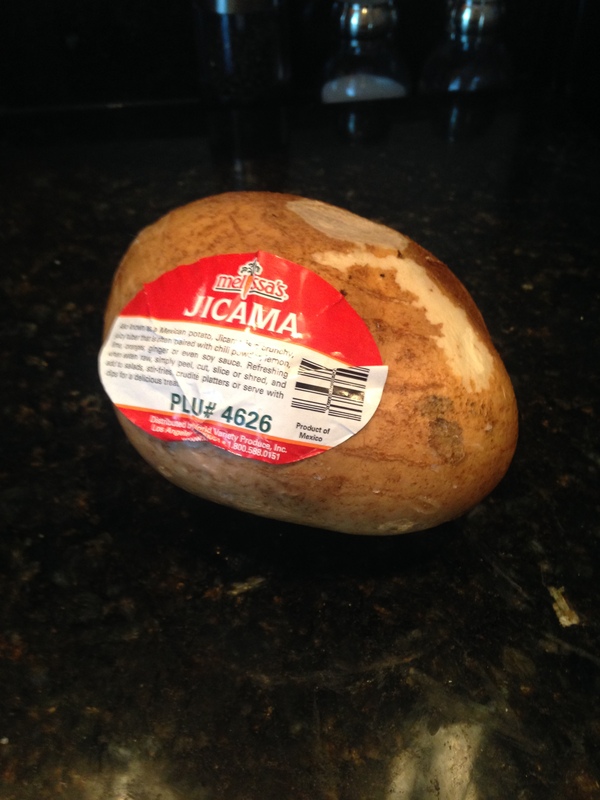 Then the jicama is cut into thin like matchsticks. 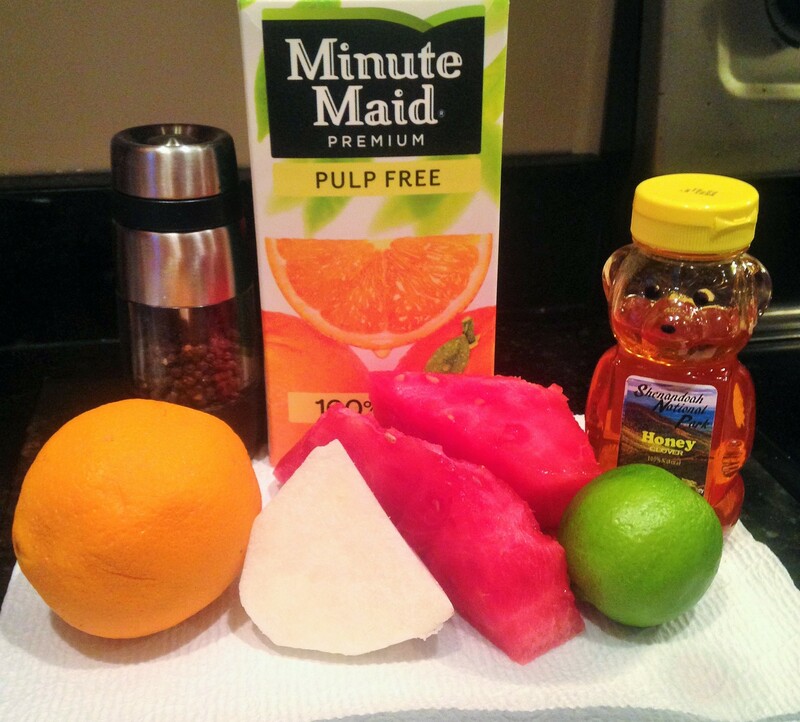 In a separate small bowl whisk together orange juice, orange zest, lime juice, lime zest, honey, salt and cracked pepper. 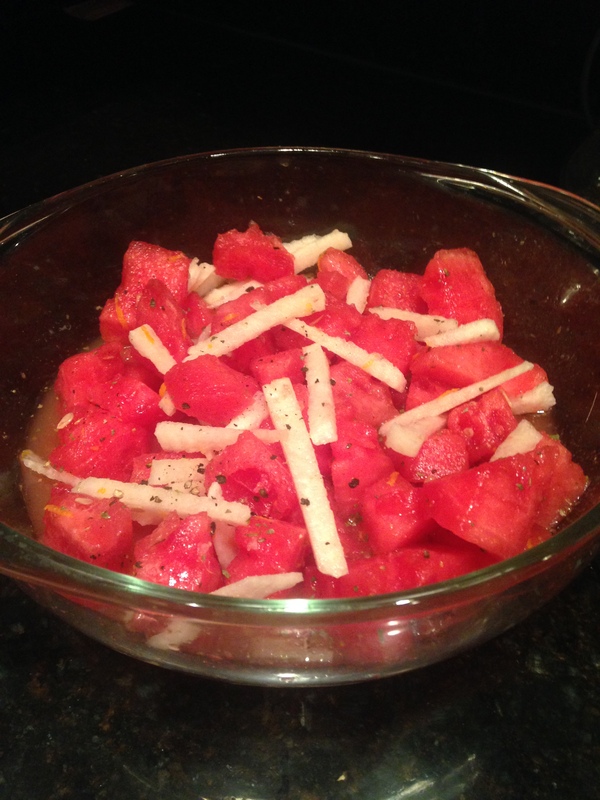 Pour dressing over watermelon and jicama, add fresh minced mint and toss together. I even contemplated adding fresh ground ginger. I will next time. Peel the jicama, which is not that easy. 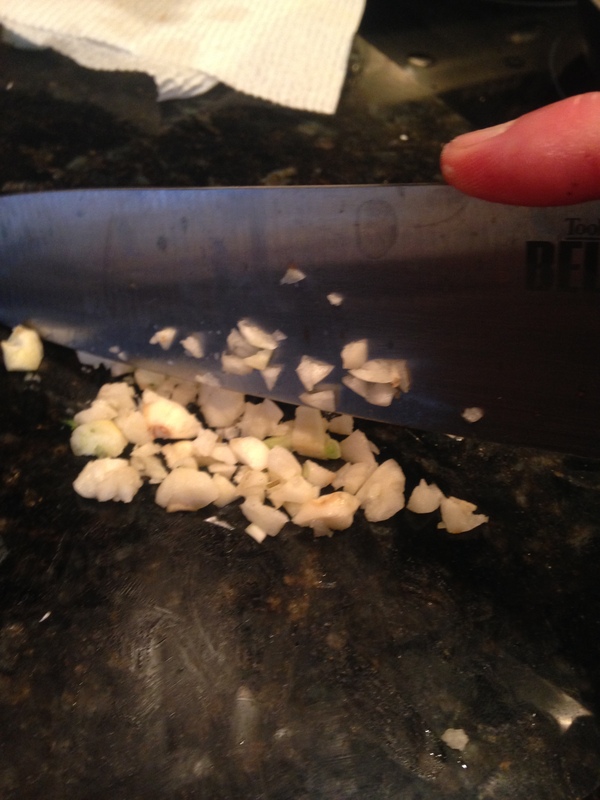 You’ll need a sharp knife and a little muscle. Fry a couple of slices of bacon. 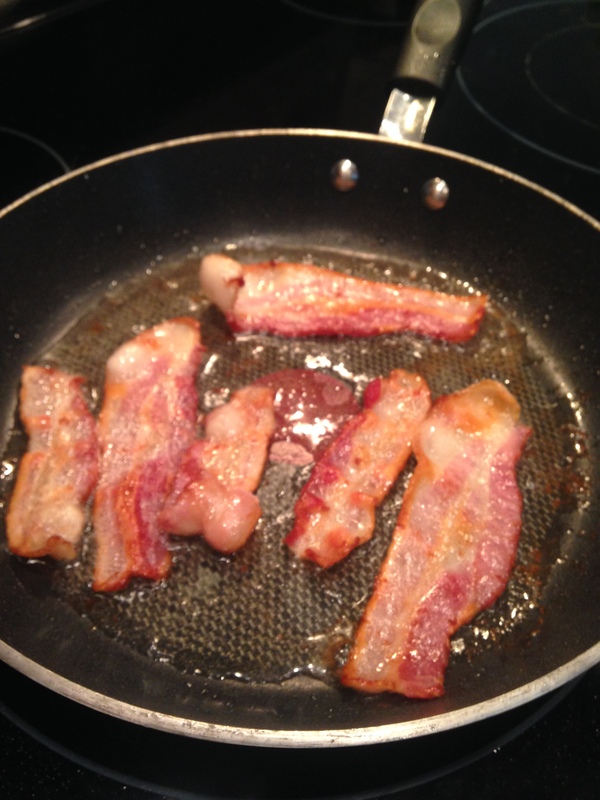 Drain bacon on paper towels, and save about a 1/4 cup of drippings in fry pan. 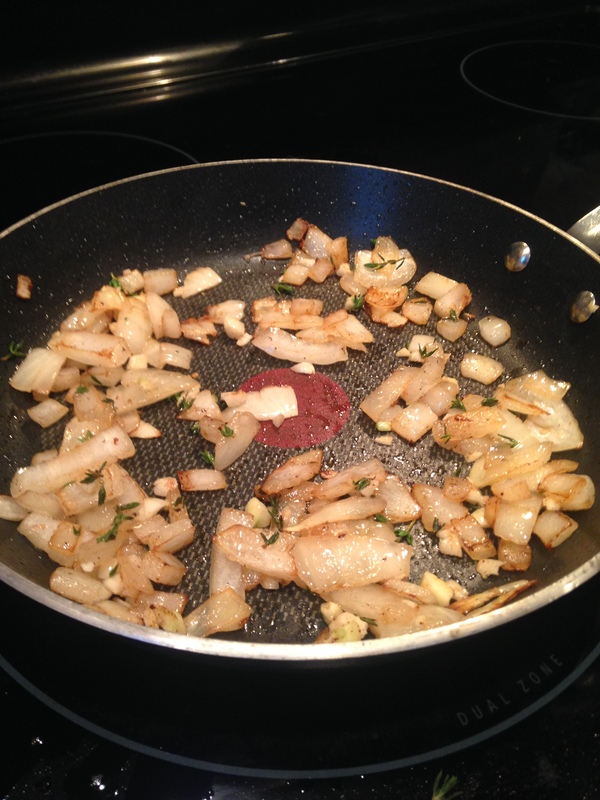 Saute onion, fresh thyme, and minced garlic in bacon drippings. 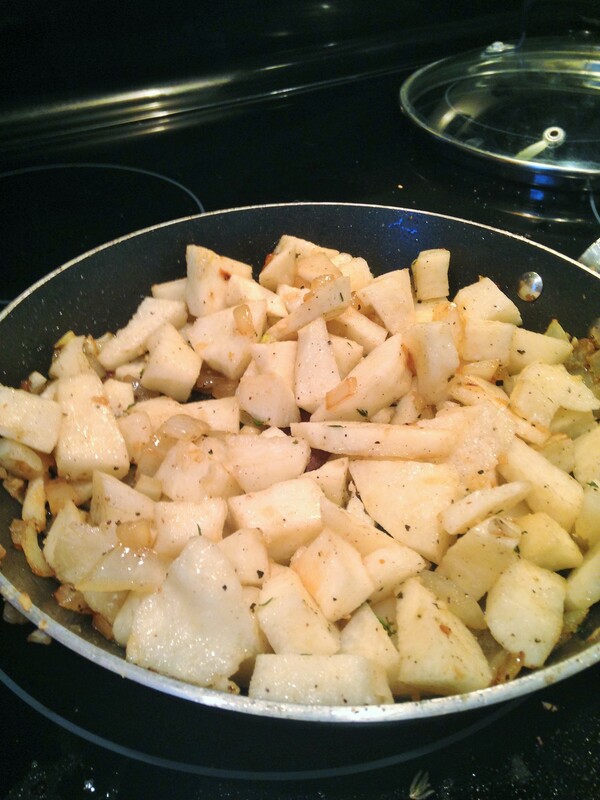 Chop jicama into small peices and add to pan with onions, thyme and garlic. Crumble bacon and add to pan. Pour in chicken stock to just cover jicama. (for more flavor I also added a chicken bullion) Cover with lid and simmer until jicama is tender. 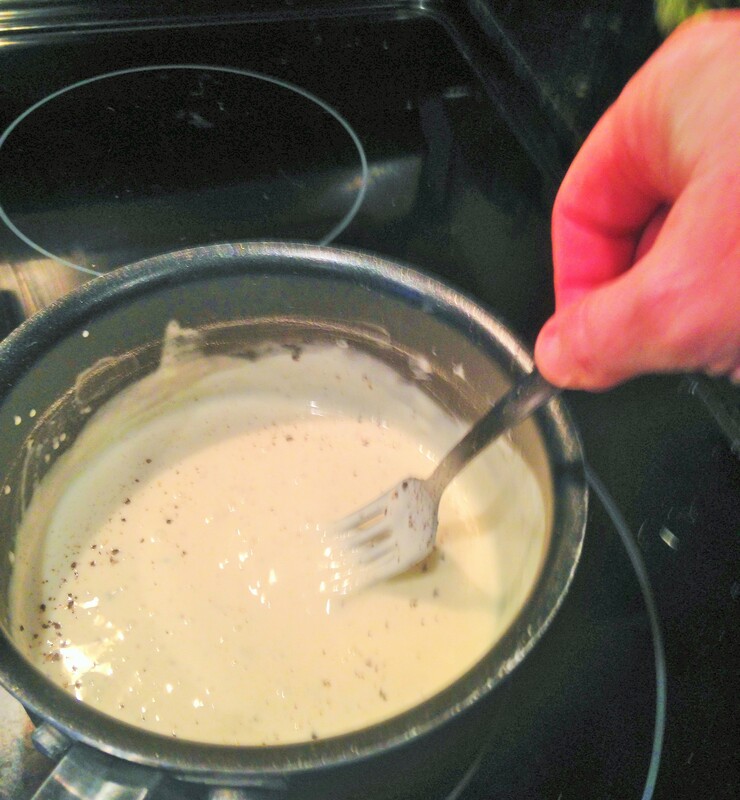 While jicama mixture is simmering, melt butter in saucepan, add flour, heavy cream and cook until thickened. Be sure to stir continually to keep from sticking to pan. Add cream mixture to jicama, stir in basil, salt and pepper to taste. Puree in batches. (of course I used my Nutibullet) Soup should be rich and creamy. If soup is too thick add chicken stock until desired consistency. Ladle soup into bowl and enjoy! 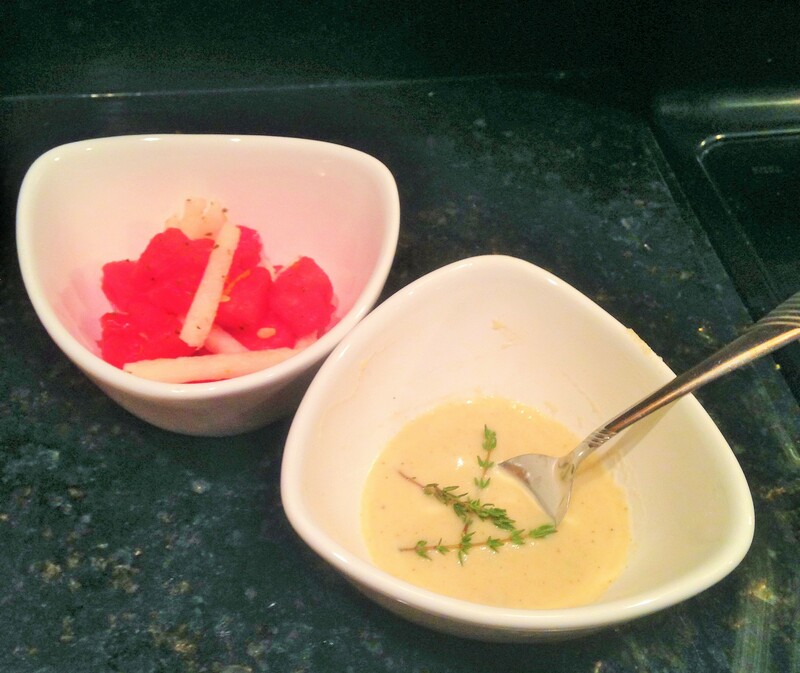 Creamy Jicama Soup and Watermelon/Jicama Salad! YUM YUM! 1. In a Dutch oven, cook the bacon over medium heat until done. 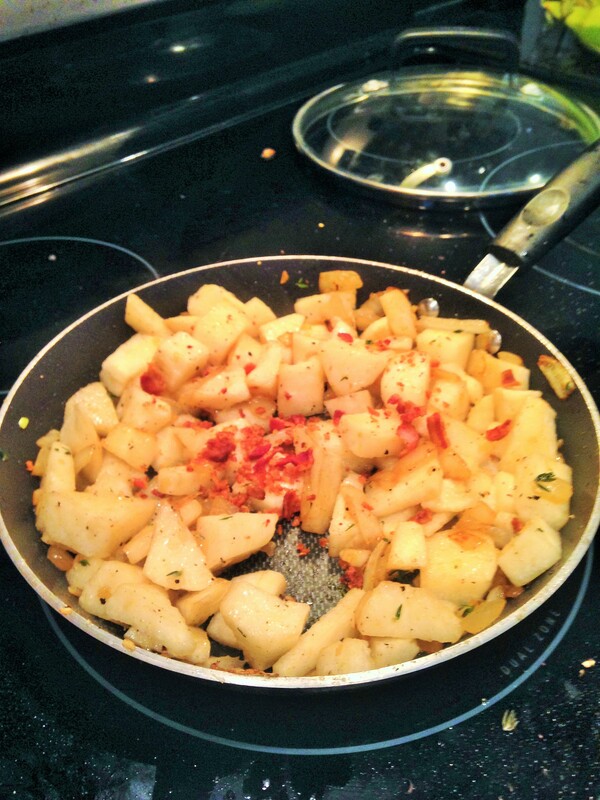 Remove bacon from pan, and set aside. Drain off all but 1/4 cup of the bacon grease. 2. 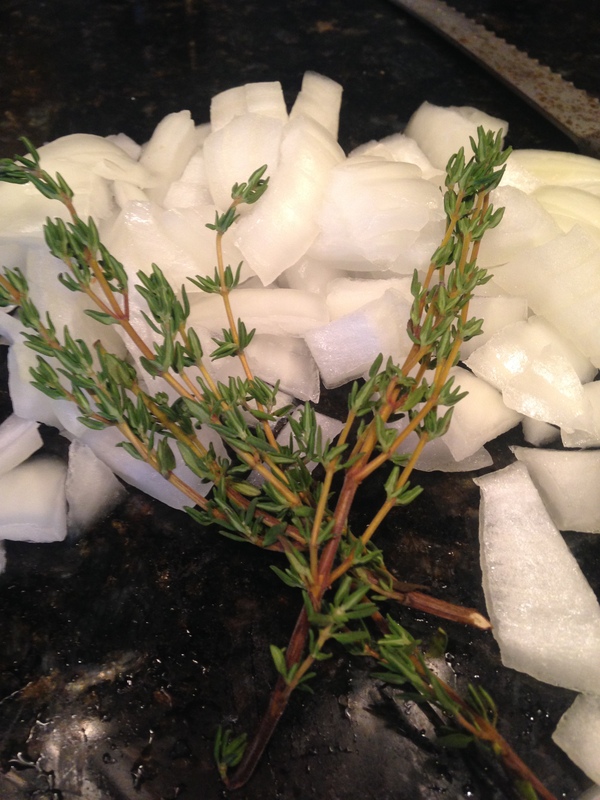 Cook onion, thyme and garlic in reserved bacon drippings until onion is translucent, about 5 minutes. 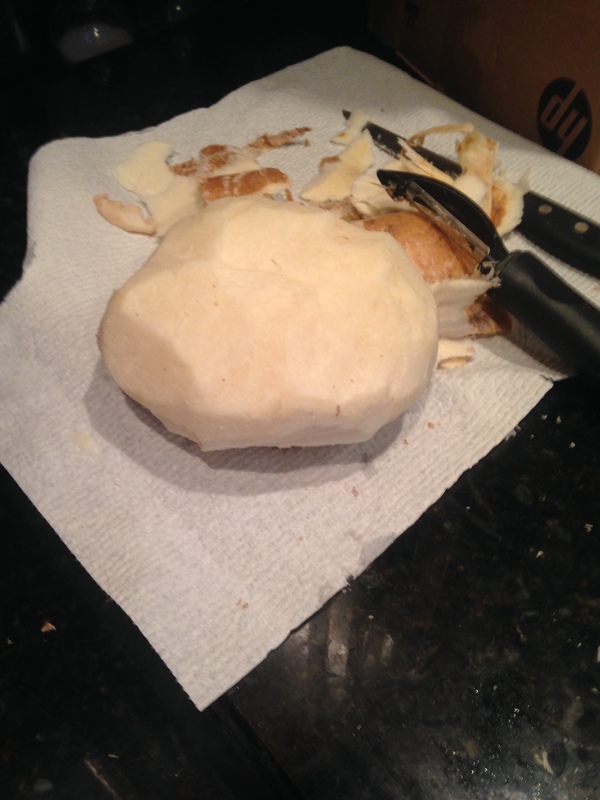 Add cubed jicama, and toss to coat. Saute for 3 to 4 minutes. 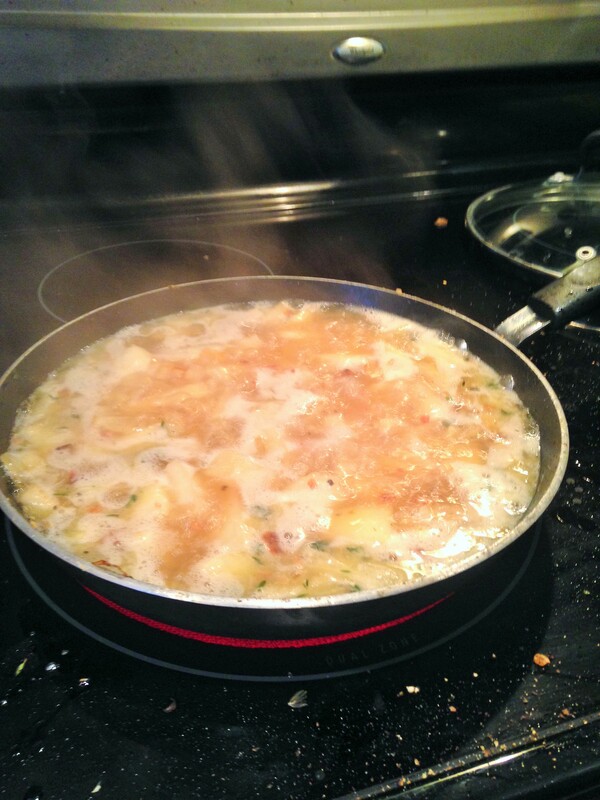 Return bacon to the pan, and add enough chicken stock to just cover the jicama. 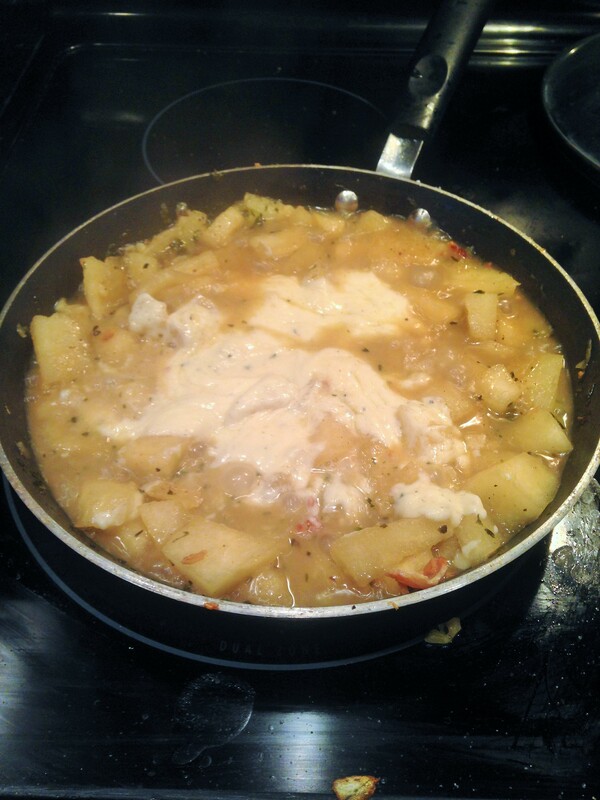 Cover, and simmer until jicama is tender. 3. 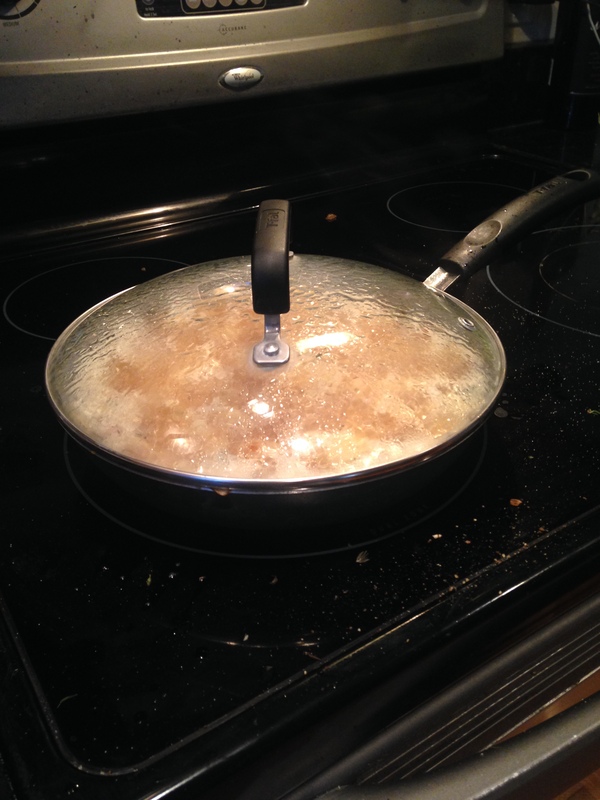 In a separate pan, melt butter over medium heat. Whisk in flour. Cook, stirring constantly, for 1 to 2 minutes. 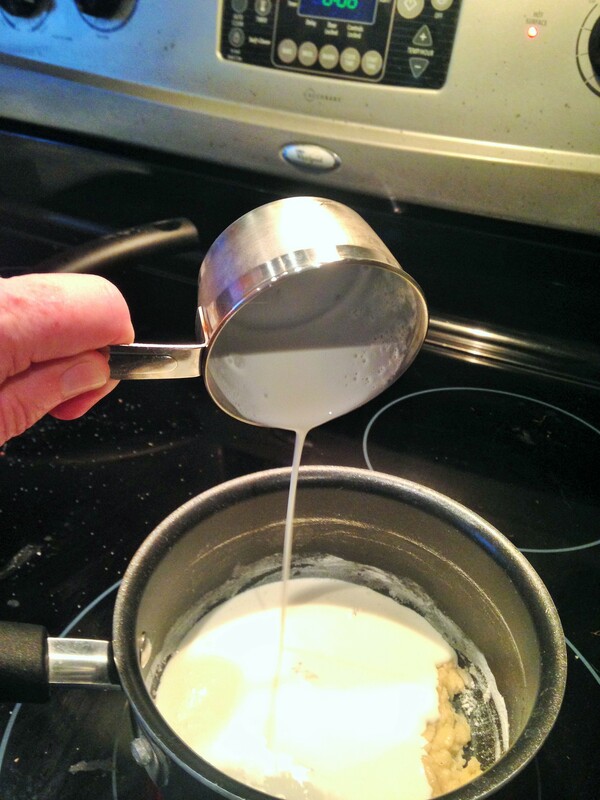 Whisk in the heavy cream. 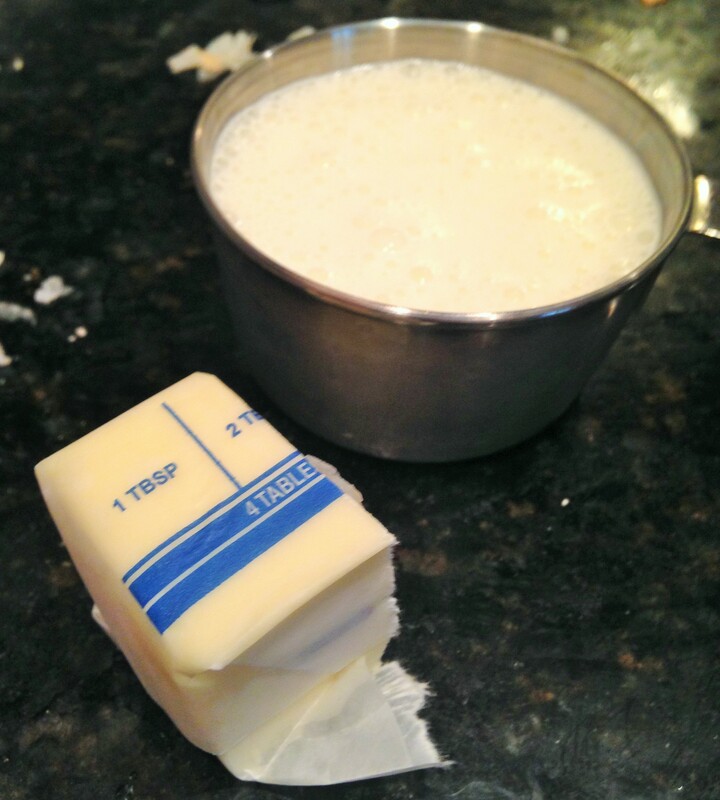 Bring the cream mixture to a boil, and cook, stirring constantly, until thickened. Stir the cream mixture into the jicama mixture. Puree about 1/2 the soup, (I pureed it all for a creamy texture) and return to the pan. Adjust seasonings to taste. 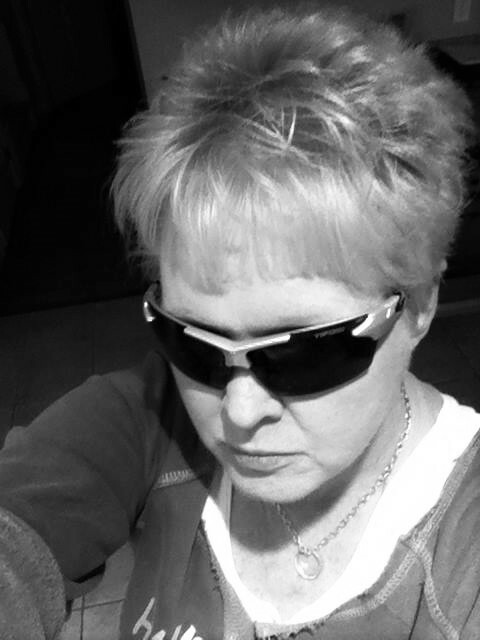 Next In Time…Who’s going to remember?